ÇGD, TGC, TGC (Journalist Unions and Associations) protested the police as they were detained, exposed to violence and prevented from doing their jobs. The protest of Journalism Associations took place as a reaction against the statements of the government targeting journalists, prevention of making news related to Gezi Parkı protest and the violent attacks of the police. Protesting the blocking of journalists by the police on the grounds that they do not possess “Yellow Press Card”, the Association of Contemporary Journalists (ÇGD) released a press statement calling the police to “take their hands off journalists”. The Association of Turkish Journalists (TGC) prepared a list of journalists detained, injured or attacked during the popular resistance. The Journalist Union of Turkey made a call for media institutions to express the news responsibly and in line with professional principles. “In various parts of our country, journalists recording the news especially in and around Kızılay-Ankara and Taksim-Istanbul have been exposed to the violence of security forces, some of them were detained and some faced harsh behaviours. “It is reported that the police arrested some journalist friends in the Beyoğlu district of Istanbul because they didn’t have ‘Yellow Press Cards.’ This is unacceptable. “One does not become journalist with a yellow press card. The journalists are intimidated so that they won’t inform the public about the police brutality. The real target of the attacks on the journalists, especially those who work in the institutions that are opposing to the government, is the right for communication in particular and the universal human rights in general. “The journalists working in the media corporations and especially those who are on duty in the field carry either Yellow Press Cards or the identification cards of the institution that they work for. The police do not have the right to interrogate or to discriminate the kinds of press cards that the journalists have or do not have. “As ÇGD, we invite the government to ensure that journalists can do their work freely and to give up preventing journalists from doing their works by false rationales. We also invite the government not to impede the public from leaning about realities and to fulfill its responsibility about guaranteeing the freedom of press, of thought and of expression. The police should take their hands off the journalists. “Journalist Union of Turkey, the representative of the press workers who are parts of proletarian classes, condemns the police brutality against protesters siting inside the tents in Gezi Park with their families and children. The Prime Minister who ordered this crime of humanity will be accountable for before History. We denounce the PM to all the international community and to humanity. “We invite media corporations that censure the realities or cover up the government’s fascistic politics by broadcasting biased and deceiving news not to be accessories for this crime of humanity any more. “If the media corporations that were turned into means of propaganda at the hands of the government had supported the ‘struggle for the freedom of press” initiated by the organizations of the profession and become mediators for the people to express themselves maybe we wouldn’t have had these social explosions. We invite these media corporations to effectuate qualitative and responsible publication and broadcast compatible with the professional ethics. “We invite all the workers of the press to resist against the media magnates that fire the journalists respecting the right of people to be informed about the realities, that ignore the pressures and threats over the freedom of press and the freedom of speech, that do not react to the government accusing the journalists and press workers in jails of being “terrorists” and that censure the struggle for the freedom of press. “To our colleagues who paid for the struggle for the freedom of press: our responsibility to our people who have just demolished the empire of fear created by totalitarian politics requires us not to remain indifferent to the truth and to shout out even louder our discontentment. “The process of punishing the freedom of press and of expression continues during the incidents started with the Taksim Gezi Park and spread to all over Turkey. The government and its forces impede the works of journalists who make news about disproportionate violence deployed against the protestors. As of today, 24 journalists were injured and 8 were arrested during the intervention by the forces of security against the protestors. It was prohibited for the journalists to enter the Taksim Gezi Park during the police’s intervention. The gas masks that our colleagues were using on duty were confiscated. That the Prime Minister Recep Tayyip Erdoğan threatens in his public speeches both Turkish and international journalists put them in a vulnerable position without any safety of life. 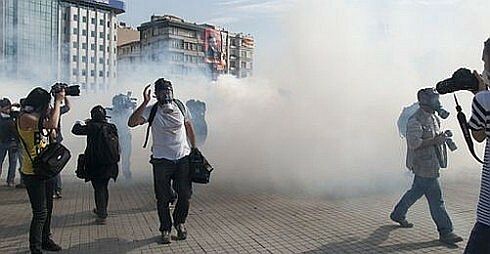 *Ahmet Şık; the reporter of Bir Gün newspaper Olgu Kundakçı; the reporter of the Reuters Osman Örsal; the reporter of Sol newspaper Onur Emre; the reporter of Sözcü newspaper Yavuz Alatan; and the reporters of ETHA Mehmet Canbek and Serdal Işık were injured by pepper gas shells fired by the police. *ATV reporter Mesut Çiftçi and ATV cameraman Ismail Velioğlu were injured in Taksim by the rubber bullets fired by the police. *Hürriyet Daily News reporter Emrah Gürel was injured from his foot during the police assault. *Star Haber reporter Osman Terkan’s finger was broken. *The director of the Star Haber TV channel Murat Uslu was injured by a pepper gas shell that hit his stomach. * The reporter of Evrensel newspaper and Hayat TV Ismail Afacan risked becoming blind due to the pressurized water fired by TOMA water cannon. * The reporter of Milliyet newspaper Hüseyin Özdemir fainted because of intense gas firing. * The police twisted the reporter of Taraf newspaper Tuğba Tekerek’s arm and insulted her. *The cameraman of the IMC TV Özgür Söylemez and the Ankara correspondent of the same TV channel Eren Güvendik were injured from their feet. * The cameraman of the Ulusal Kanal Bülent Ünal’s ear was torn. *The photo reporter of Milliyet newspaper Ercan Arslan was injured by a tear gas shell; his foot was stitched in several places. *The photo reporter of Zaman newspaper Celil Kırnapcı was injured from his head hit by a stone thrown by the protestors; he had stiches in his head. * The chief of intelligence service of Zaman newspaper İbrahim Doğan’s arm was broken by a pepper gas shell. Doğan was admitted to the Taksim First Aid Hospital. *The reporter of Zaman newspaper Cihan Acar’s arm was broken by a pepper gas shell. *One of the editors of Milliyet newspaper Can Şişman was injured from the back of his head by a pepper gas shell. They sutured his head with 4 stiches at the hospital. *The reporter of Milliyet newspaper Samet Akten sprained his ankle by falling down from a high place in the uproar occurred during the police intervention. *Erhan Karadağ, Ankara representative of the Kanal D TV channel was arrested. *Fatoş Kalaçay, Ankara correspondent of the Sol newspaper, was beaten and arrested. *Serkan Bayraktar, the cameraman of the Ulusal Kanal TV and Mustafa Kaya, Ankara representative of the same TV channel, were arrested while they were broadcasting the protests on live.